Instant Screen | Pre-screen and pre-qualify car buying prospects. 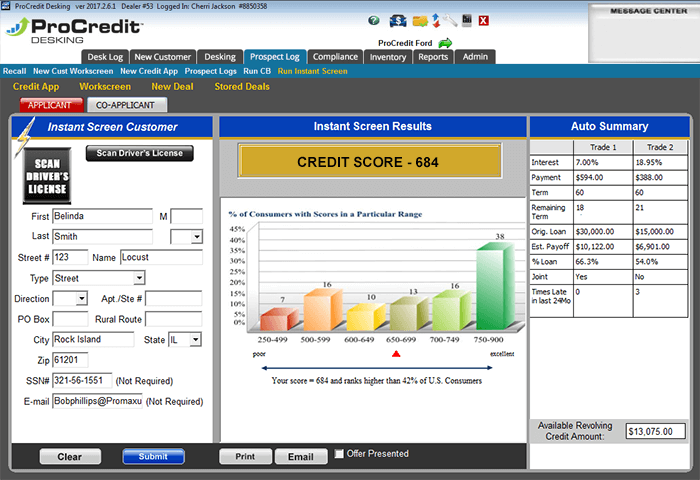 1) You can use Instant Screen as a stand alone application in tandem with pulling credit bureaus. 2) You can use ProMax Unlimited's CRM solution to automate the Instant Screen process - Every showroom visit and internet lead can automatically be screened or be screened manually as desired. No social security number or customer signature required. You can print pre-qualification certificates directly from your system, order them from Instant Screen, or we can send them out for you. Also, ProMax Unlimited or ProCredit users can view the Auto Summary by clicking on the interest rate link under the CB score in the desk log or prospect log. Imagine your managers knowing both the CB score and EXACT interest rate of your prospects trade in as soon as they pull a credit bureau! Would your manager have an advantage working this deal? Would it help him close the deals? Hold gross? Bump payments? Imagine your competition using it and not you!